Hanukkah Fundraiser - If Not Now, When? You are invited to a community Hanukkah celebration for peace and co-existence, with candles, songs, dancing, stories, dreidels and latkes! This kid-friendly and adult-pleasing party will also raise funds for Yad be-Yad (Hand In Hand) Jewish-Arab School in Jerusalem, a model of co-existence. Featuring: songs and sing-along with the Victoria Jewish Community Choir and music and dancing with The Klez band! Please bring a vegetarian dish to share (with ingredients noted), and your own plates and cutlery. Let us know who's coming. 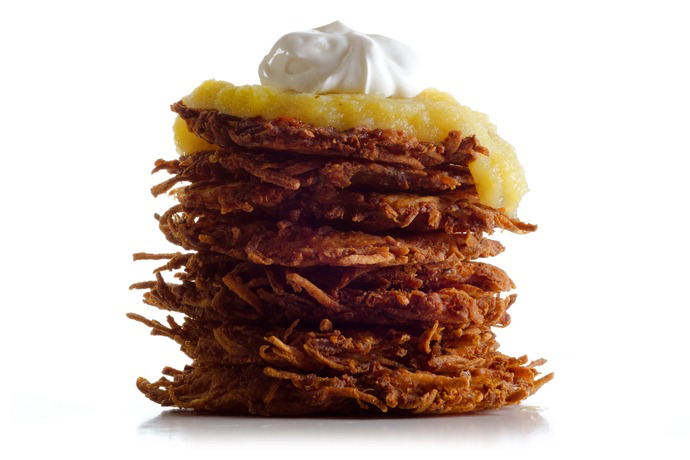 "A Great Latke Was Eaten There...."
Can't make it? Please consider donating to Hand In Hand School through the Jewish Federation, noting in the "message" section that you are doing so in conjunction with the If Not Now, When? charitable Hanukkah event.